We refer to them as "scrums"... diving on loose balls. Securing a few loose balls (for a few extra possessions) can make all the difference in a close game... plus it sets a tone of "scrappiness" and toughness. A great hustle play is often a great team motivator and energizer. Here are a few loose ball drills. This is a good drill for emphasizing hustle and going for loose balls. It also works one-on-one offensive skills, man-to-man defensive skills, and rebounding. A "laid back" player can actually be taught to hustle, and get after the ball and the opponent. Refer to the diagram. Divide the team into two groups. They will be competing against each other, so even out the speed and talent. Line each team up along a sideline. Each player is given a number, 1,2 ,3, etc (see diagram). Try to align your post players into the 1 and 2 spots, and the guards further out (3 - 5). Have the players get down on their knees, or all fours, facing away from the floor. Have a coach or manager check to make sure they don't peek! If they cheat, the other team gets a point. The coach places the ball somewhere on the floor, equidistant from each team. You could place it out high, or even down in the paint. Coach then yells a number 1 through 5. The player from each team whose number he calls, runs out and gets the loose ball. The player who gets the ball, then takes it to the hoop and tries to score, while the other player defends. Keep playing until the offense scores, or the defense gets the ball. Award one point for getting the loose ball, and another point for the scores. Play to 10. Losers run! 1. You can call more than one number at a time... e.g. "2 and 5! ", or "everybody". Be careful though, if you call too many at one time, there could be a collision going for the ball. Make sure you rotate the numbers called, so that all players are eventually called. 2. If defense fouls, have the offensive player shoot one free throw. If he/she makes it, it counts as a score. See the diagram. This drill features grabbing a rebound, making an outlet pass, running after a loose ball, and then a layup. Start with a player in the lane on each end of the floor. The coach (C) and an assistant (A) will set up on the wings for the outlet pass. The player puts the ball up on the rim or backboard, grabs the rebound, and makes a strong two-handed overhead pass to the coach (or assistant) on the wing. The coach then rolls the ball up the floor. The player sprints after the ball, retrieves it and takes it in for a layup. Then he/she rebounds and outlet passes to the assistant on the opposite wing and the procedure repeats on that side. Run the drill in one direction (right hand layups) and then reverse it on the opposite side (left hand layups). This drill was contributed by Coach Ken Sartini, Arlington Heights, IL, and is more advanced, combining a number of things into one drill. See the diagrams below. We use two coaches (C). In diagram A, the players form a line on the right wing. The grey triangle is a chair or cone (to slow the offensive player down a little). One player (B) starts in the lane in helpside position. Player A makes a back-cut (or a V-cut if you prefer) and receives the pass from Coach #1. Player A dribbles around the chair, to the hoop. 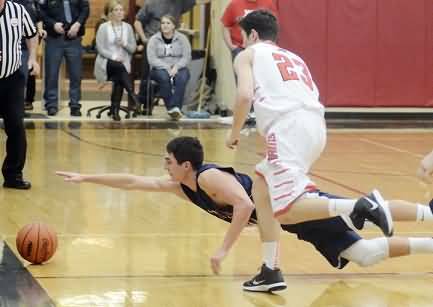 Player B slides over and takes the charge (making some noise when he/she falls). To avoid injury, have player A make a jump-stop into player B, and then try to focus and make the jump shot. When a good charge is taken, the coach yells "offensive foul", and the entire team yells "great call ref!" Player B rebounds and passes back out to Coach #1 (diagram B). Coach #1 rolls the ball out sideways near the 3-point arc, and player B sprints and dives on the loose ball, gains control and passes out near half court to Coach #2. Player B then sprints to the far basket, and receives a long lob pass from Coach #2, and makes the lay-up. Next, he/she rebounds the lay-up and then dribbles up the sideline for a reverse lay-up at side basket #1, and then dribbles to side basket #2 for a jump stop and jump shot. Optionally, instead of lay-ups at the side baskets, you can have Player B make two dribble moves (e.g. "rocker-step" and "in-and-out" moves). Player B then returns to the end of the line. Player A rotates to become Player B.